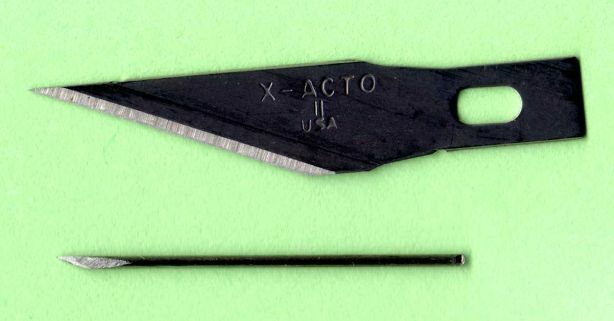 A wire knife consists of a blade made from a piece of steel wire installed in a pin vise. For the wire, visit a hobby shop and purchase some "music wire", also known as "piano wire". I suggest 0.032" (.81mm) size for reasons explained below, but really you can use pretty much any size from 0.032" up to about 1/8". I don't recommend any thinner than 0.032" because the wire gets too flexible. Whatever you do, make sure the pin vise you have will hold the wire size you choose. Music wire is cheap; you'll probably spend about two bucks and get enough wire to make wire knives for all your friends. I know that you'll be tempted to buy several sizes of wire in order to end up with several sizes of wire knife. The fact is, that's pretty much a waste of time. 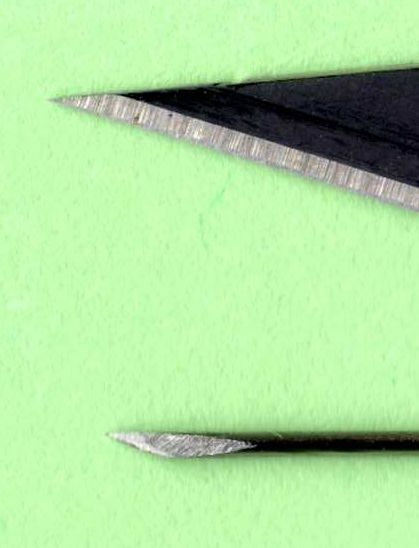 Regardless of the size wire used, the very tip of the wire knife -- which is what you cut with -- is virtually identical. The only differences the size wire makes is in the stiffness of the shank of the blade and in how much it obscures your vision while carving. See Rubber Stamp Tools for tips on obtaining a pin vise. My own personal preference is to use a hobby knife handle of the type in which the collet has two splits forming an X when viewed end-on. This type handle will only fit a wire about 0.032" (.81mm) diameter, but actually that's a very workable size wire for making wire knives so that's the size wire I use. Another possibility is to use a drafting pencil. There are mechanical pencils of various types that are designed to hold lead but will hold steel wire just as well. The problem with some of them is that they don't hold it particularly firmly, and may allow it to wobble around while cutting. But there are types of mechanical drafting pencils that have visible spring-loaded grips that hold a lead quite firmly indeed. In fact, if your wire is too small for this pencil to grip it, you can simply wrap some tape around the shank of the wire to make it grip better. Finally, if you're really cheap, you can just drill a tiny hole in the end of a wooden dowel and glue in a piece of wire. Of course, if you ruin that blade, you'll have to start over. Insert a length of music wire into your pin vise and clamp it securely. Then cut off the wire leaving about 5/8" protruding from the collet. Making a wire knife involves grinding two flats on the tip of this wire. The two flats intersect to form the cutting edge. The description below involves the use of a bench grinder. There are other ways that will probably work, including use of a cut-off wheel mounted in a Dremel. Before proceeding, make sure there is a cup of water near your grinder. And don a pair of strong reading glasses, +3.5 or so, to help you see what you're doing. Be sure to observe all safety precautions involved with a bench grinder, such as making sure long hair is tied back and there's no loose clothing that could get involved. The following is a detailed description of exactly how to hold the pin vise while grinding the tip into a knife edge. It's not difficult to do but it is rather difficult to describe clearly, so bear with it. Heck, you can waste a couple of pieces of wire trying to figure it out, the stuff isn't expensive. First, position the wire pointing directly away from you and parallel to the grinding surface, as shown. Locate one of the splits in the collet straight up. Next, roll the pin vise about 30° toward the grinder. Finally, angle the tip of the wire just slightly toward the grinder. Neither of these tips is wrong; it's merely a matter of personal preference. The long, slender point is excellent for carving the most intricate details, but it's also very fragile and can easily get bent if you get too forceful with it. The stubbier tip works fine for most regular carving tasks and is much more rugged. The difference between these two tips is only a couple of degrees when angling that tip toward the grinder. With the pin vise held in this orientation, move the tip of the wire into the grinder. Try not to rotate it or let the angle change; you're grinding a flat surface. Don't push too hard or the wire will flex, which will affect the angle. Using a typical bench grinder, grind no longer than about five seconds, then retreat and immediately dip the point into the cup of water to cool it. You want to be grinding the tip, not melting it! Now, switch to the other side of the grinder, roll and angle the pin vise exactly the opposite way, and grind exactly the same way on the opposite side. Again, only five seconds at a time, dipping in water each time to keep the wire cool. Switch back and forth, side to side, always holding the same positions when grinding. At first the tip will look like a mess that doesn't resemble a cutting tool at all, but after three or four times on each side, the two flats will come together at the tip and quite suddenly it takes on the appearance of the illustrations above. You'll want to look carefully at your work and check to see if it's symmetrical, that each side looks pretty much like a mirror image of the other. If you are holding the pin vise at a slightly different angle on one side than the other, you'll be able to see that one side seems to have a longer face than the other. Adjust your grinding positions and keep on grinding until it's right. If you don't position the pin vise exactly the same way each time and then make very brief cuts, you end up with a "faceted" surface; you see a bit of this grind and a bit of that grind, all coming together in a patchwork. So, the very last grind you should make on each side should be held steady against the stone for the full five seconds to completely clean up the surface and ensure a single uniform flat surface on each side. It's already sharp, but it's not a good carving tool yet. You need to hone it. 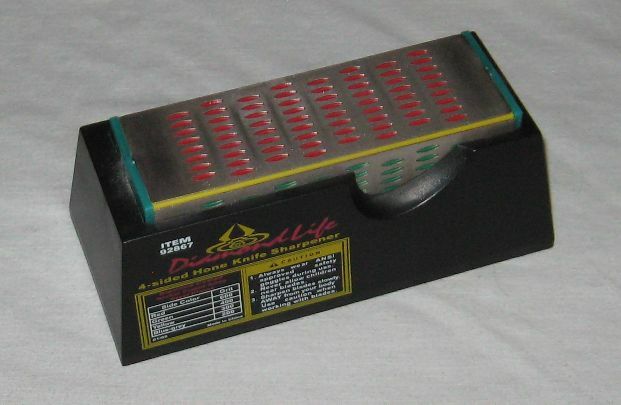 You will need a very fine knife sharpening stone such as either an "Arkansas stone" or a flat ceramic sharpening block; a typical knife sharpening stone -- the thing that looks like an 8" long block of concrete -- is too coarse for this job. You will also want to use some honing oil on the stone. You can get both items from any place that sells fine sporting knives. Alternatively, you can get a diamond knife hone. Some have multiple grits all in the same tool, but if you have a choice of grits you want the finest available, usually 600 grit. 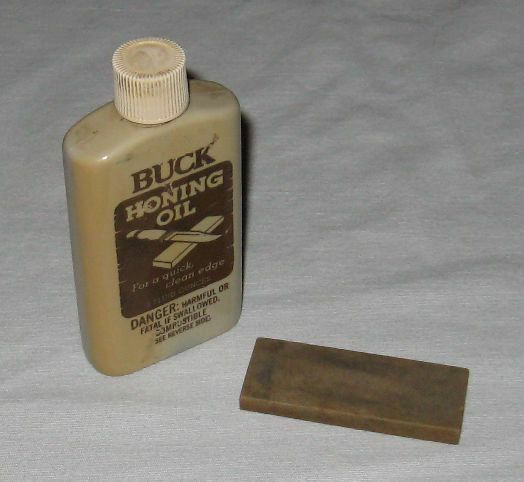 You don't use honing oil with a diamond hone; it works fine dry. Diamond knife hones always seem to have a pattern of holes in the surface. That works great for knives but it's unfortunate for this job. You will need to be using an area without holes, such as one end of the hone shown. You only need a tiny area. Note that sometimes the grinding process leaves a bit of flashing right along the cutting edge. You'll need to hone until this little thread of metal comes off, and then continue honing until the edge itself is smooth and sharp. Once you get practiced at the honing process, try this: After honing both sides, go back and hone both sides again only much lighter -- just barely touching the stone, and only one or two strokes per side. Ideally, the last couple of strokes should be feather-light.